do you have any plans on making the walls do this as well. The diagonal fences are brilliant! 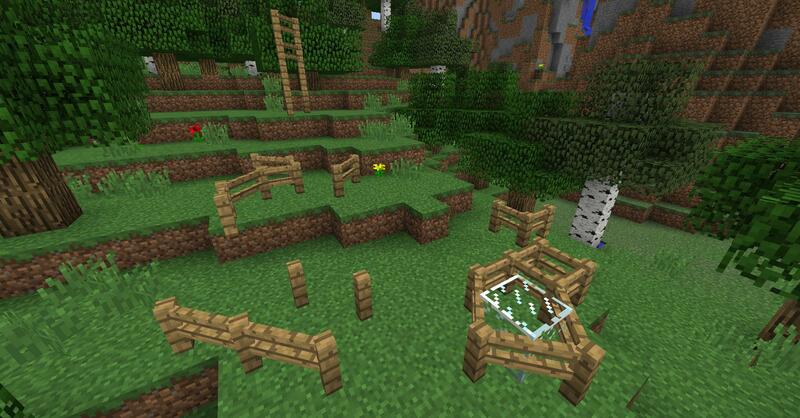 It's so nice to see another little rebellion against everything-at-90-degrees Minecraft orthodoxy. :) I'm using a 256x testure pack (MojoKraft V16) and the diagonal fences just automatically pick up the texture. They are not a PERFECT match to a vanilla fence, but you have to look closely to see the discrepancy. Today is the first time I've used them and I love them already. Oh hey, here's another idea for you: Horizontal fenceposts. Say you've laid out a farm plot and you want to place lights above it. What if you could place two or three fenceposts to make a vetical post either side, then put a horizontal fencepost rail or beam between them to hang lights from? Or maybe you just want a different style of fence, with wooden rails between stone pillars. Basically it's just a fencepost with no side rails, turned on its side. I dunno if anyone has asked this but... have you considered making diagonal fence gates? I think that they'd be super awesome and add to the aesthetic of the mod as well! I am soo happy that you created this, thanks you.. I do have a question , is there a way i can change fence to different colors? Awesome job, well done. 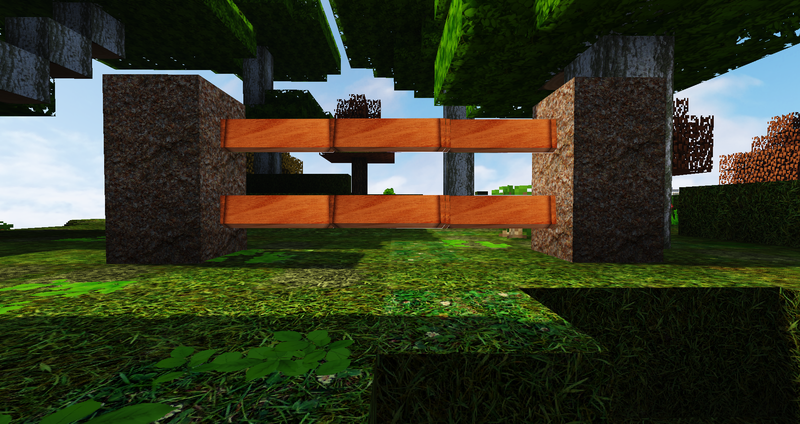 This mod does support resource packs; though the texture used for the fences' wood is the vanilla default textures for those woods, if you do not want to write all of the silly jsons for yourself. 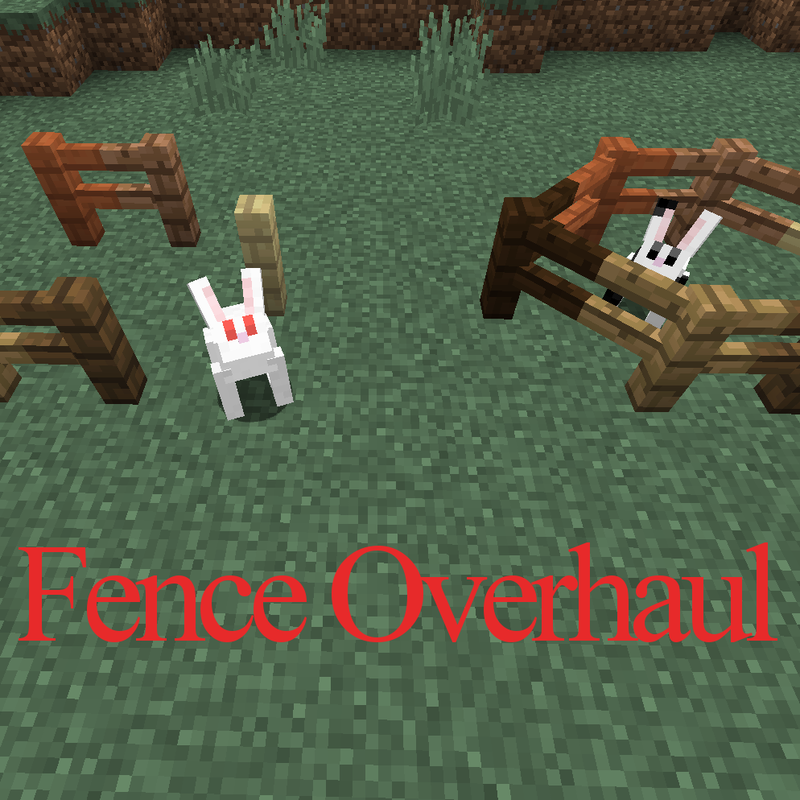 If you want to change the model used by the fences, you can easily use a different template in your resource pack (the mod will dynamically derive the individual fence model jsons with it). thanks you for getting back to me.. That sounds complicated.. I will leave it to the experts. I love the mod .. nice work.. Keep up the great job. cool thanks i will look at that.. Awesome, is it possible to code in vertical diagonal fences? Like for staircases and such? That'd be awesome. Latest version crashes for me in 1.12.2. It sounds like you might have your hands full with that mod, based on the one result of a quick search... but I could definitely use the insight to the 1.8+ rendering nonsense -- especially if you know a way to do that without needing to rerender the fence each frame. I'm also still smashing my head on the logic for the angles involved for the vertical-diagonals. It has been almost ten years since I studied trigonometry, and it shows... I'm almost at the point of doing it the lazy way. YAY! You updated it... yes it's me... Thanks! Hey meeloc. Yep, an update. More for some of my other stuff is in the works, too. Mark the latest version for 1.12.2, so that people don't have to download it from the site, please. The non-vanilla ones were not intended to be used. New version limits it to specifically only the vanilla woods. Are you sure about that? No one's said anything, but I'm using 1.3.2 and checking with the LoadingProfiler, this mod's taking 50 whole seconds to initialize, more than everything else combined. It seems to be checking every single block and then also doing something with optifine. Here is a monstrously long gist of everything fenceoverhaul related from the log.